With endless shopping, dining, and entertainment just steps away, The Westin Galleria Houston puts you in the center of Houstons chic Uptown district. The hotel is connected to The Galleria shopping center, home to Nordstrom, Macys, and Saks.Guests will discover everything they need to feel their best, from our 24-hour WestinWORKOUT Fitness Studio to the wholesome fare of the Daily Grill restaurant. And, with more than 72,000 square feet of meeting space, we can host any event in style.Our 487 guest rooms and suites are designed to leave you feeling your best. Indulge the senses with our world-renowned Westin Heavenly Bed, Heavenly Bath, complimentary Starbucks coffee, and stunning views of the vibrant city of Houston. 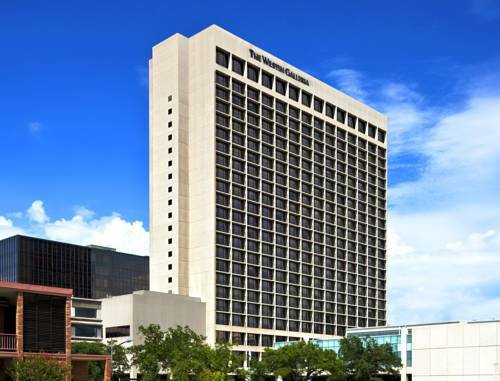 With Houstons fashionable Uptown District at your doorstep, The Westin Galleria Houston offers you a world of shopping, nightlife, and local attractions. Located near The Galleria, youll enjoy close proximity to high-end retailers like Nordstrom, Saks Fifth Avenue, and Macys, and popular stores like Old Navy and DSW. Take a break from shopping and refresh at one of the many world-class restaurants in the area. If youre in town on business, youll find a variety of corporate offices within walking distance. For drinks after work, The West End Pub serves a great selection of American and European beers in an English pub-style setting. The outdoor patio is a popular gathering place for locals and visitors. For a night on the town, hit the dance floor at the Belvedere Lounge, or step on stage for a sing-along at Spotlight Karaoke. If youre traveling with family, treat the kids to some fun on the famous indoor ice skating rink at The Galleria. Or venture out to the citys museum district, and explore the Childrens Museum of Houston, the Museum of Fine Arts Houston, and the Houston Museum of Natural Science, to name a few. Stop by Street Level Lobby Bar for signature cocktails, fine wines, and light bites in the evening. Sample the best of eclectic cuisine while trying out local libations at White Oak Kitchen + Drinks. Discover classic American fare prepared with a contemporary twist at Daily Grill. Whether you re in the mood for a hearty meal, a healthy salad, or a refreshing cocktail, you ll find something to please your palate.